Thank you to the ECS PAC, the Grades 4 to 9 classes had the pleasure of listening to author, Kevin Sylvester. 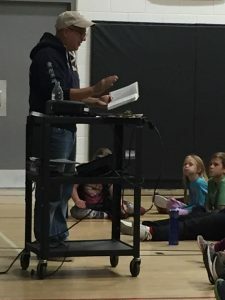 Mr. Sylvester is knowns for both his graphic novels, sports books for kids, the Neil Flambe series, as well as the MINRS services for Middle Years students. Being courageous and trying your best were the major themes of his talk. He was not always the best illustrator, but after years of practice and training, drawing is now his passion!